A month long Summer Training Camp (Sanskratik Virasat Prashikshan Shivir) which was held at the City Palace, concluded yesterday with art exhibits and cultural performances. The chief guest of the programme was Executive Trustee, MSMS II Museum, Ms. Rama Dutt. As many as 250 participants from Jaipur as well as different parts of the country participated in this summer camp. On this occasion, Ms. Rama Dutt said that in this summer camp children learned a lot of art and skills which boosted their confidence. During the camp, children were taught traditional folk dance and music. She hoped to see the children next year with the same excitement and zeal. The closing ceremony began with Ganesh Vandana. This was followed by the participants singing popular traditional folk songs sung during weddings in Rajasthan like Bajuband Ri Loom, Choti Si Umar Parinaayi Re Babosa, Bana, Ghoomar and many others. 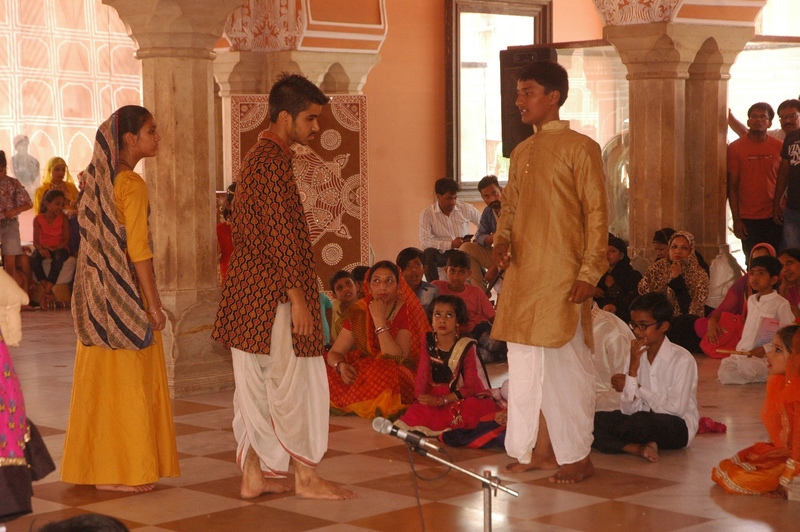 Participants of the dance workshop were simultaneously performing folk dances on them. There was also a blend of musical performance on Flute and Algoza accompanied by instruments like tabla, sitar and chang on the melodies of popular folk songs like ‘Baisa Ra Beera’ and Rajasthan’s Shekhawati region’s ‘Dhamaal Ki Dhun. The programme concluded with a theatre performance curated by the students on the story of a couple from a middle class family wishing to go on a pilgrimage to Badrinath, how they work on their backs dedicatedly to save money for the pilgrimage and how their faith gets them there. It talks about the theme that everything is possible with faith, patience and belief with a moral that ‘God helps those who help themselves’. There was also a spectacular display of art made by the participants learned during the workshop which included Miniature Paintings, Mandana Art, Calligraphy and Puppets for the audience to see.